Malala Yousafzai, the young woman shot by the Taliban as a teenager, will follow in the footsteps of George Clooney, Leonardo DiCaprio and the Duke and Duchess of Sussex in addressing a charity event which seeks to eradicate homelessness in Scotland. Ms Yousafzai, 21, the world’s youngest Nobel prizewinner, is to speak at a dinner at the Edinburgh International Conference Centre on 13 March, hosted by Social Bite. The event will be an opportunity to thank the fundraisers behind Sleep in the Park 2018, when members of the public slept outside across Edinburgh, Glasgow, Dundee and Aberdeen. Representing South East Scotland Scouts will be Lorna Spence, GSL of 100th Pentland and some of her youth members. The 100th held a Wee Sleep Out in support of the charity last November with around 60 Cubs and Scouts at Bonaly. They smashed their target of £1,000 reaching £4,300 for the charity. Well done to all of them! 13,800,000,000 – the number of years travelled in time by the 80 Beavers who took part in a sleepover at Dynamic Earth in May. It was a great experience to explore this popular attraction after all the visitors had disappeared. 6.4% – the increase in young people in the district since the 2017 census. 4 – the number of special awards that have been presented in Pentland. 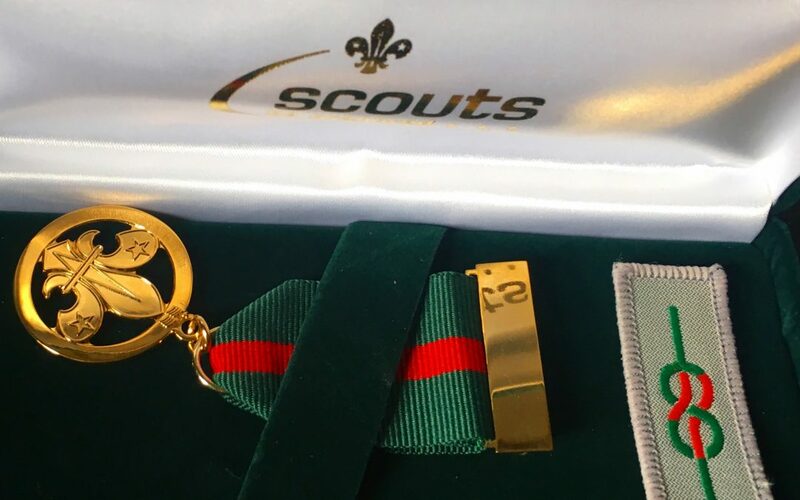 Well done to Ben Walker (19th Scouts) and to Stewart Nicoll (98th Scouts) in receiving the Commendation for Good Service Award, Claire Dallas (Active Support) for being her Award for Merit and to Natalia, who is a Cub at the 92nd who was presented with a Meritorious Conduct Award. 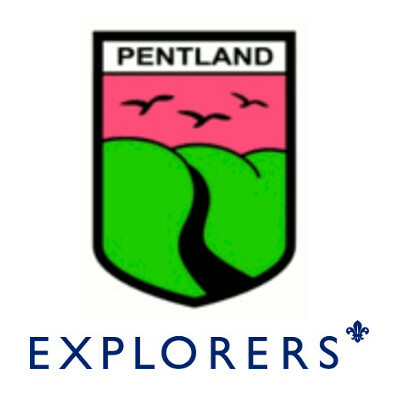 11.6 – the number of kilometres that the 40 Scouts who took part in the Pentland Hills Expedition Challenge hiked over 2 days. 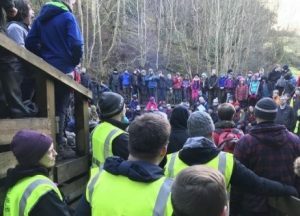 530 – the number of sausages cooked for breakfast for the 180 Scouts, 60 adults and 10 Explorers at the Brass Monkey camp at Bonaly in February. The wet weather didn’t dampen the spirits for those taking part in the Monopoly themed event and a great time was had by all. Well done to the winning team who were from the 100th. 10 – the numbers of days that 2 patrols from Pentland spent at the Blair Atholl Jamborette taking part in a variety of activities and meeting Scouts from all over the world. 5 – the total number of goals scored in the final of the Pentland District Football Cup which was held at the World of Football in May. The winner of the trophy were from the 19th as they overcame tough opposition in the final from the 107th. 50 – the number of Cubs who came along to Bonaly for the Sixers and Seconders camp in September. During the camp the Cubs learned some of the skills they needed to be effective leaders as well as having a shot on the challenging high ropes course. 265 – the number of fantastic adults who make Scouting happen in the District. Without all their hard work and support, the young people would not get the amazing experiences that have been offered to them over the past year. 485 – the score of the winning team from the 9th at this years District Flag camping competition. 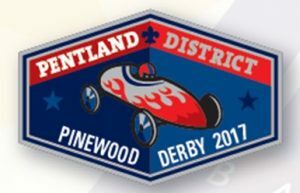 200 – the number of cars that were raced at the first ever Pentland Cubs Pinewood Derby in November. Cubs designed and build their own cars from kits given to them and over the space of a day in November, raced them on the specially designed track. 1 very happy outgoing Acting District Commissioner! 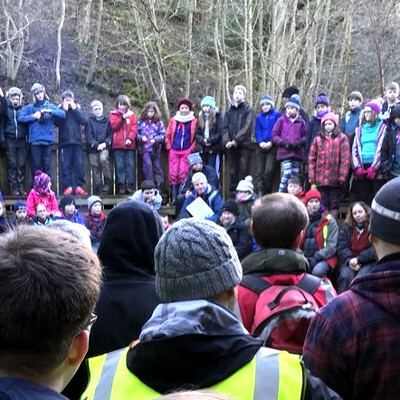 Over 180 Scouts made the trip to Bonaly for the annual Pentland District Brass Monkey Camp. Despite the constant Saturday rain and cold temperatures, everyone had a great time taking part in all the activities. The Scouts took part in a Monopoly-themed activity where they had to go round 36 activities that were on their board to earn either a house, hotel or skyscraper depending on how well they did. Activities included minefield, space hopper racing, sushi sweeties, and a bush tucker trial. The winning team came from the 100th troop and received a special Brass Monkey hat for their efforts. A huge well done to those who were responsible for planning the camp and making sure that the event ran so smoothly throughout the weekend. Also, well done to the nearly 60 adults and 10 Explorers who were there to help with running activities, cooking meals and keeping all the Scouts safe and happy. 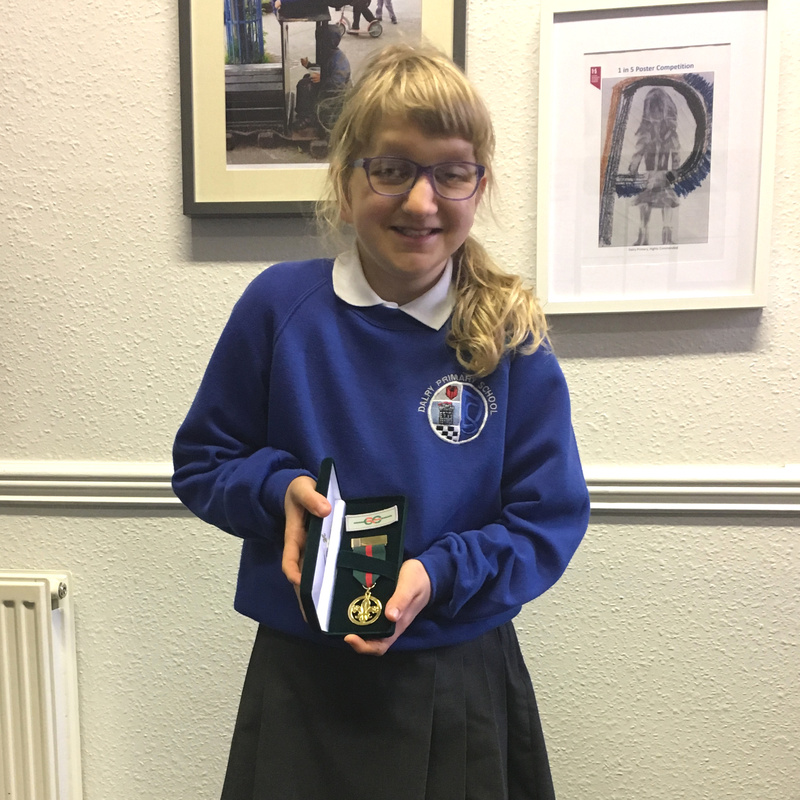 Natalia, aged 9, was presented with The Cornwell Scout Badge and the Meritorious Conduct Award, in recognition of her devotion and enthusiasm for Scouting despite suffering a life-threatening illness and undergoing major surgery and for showing great courage throughout. 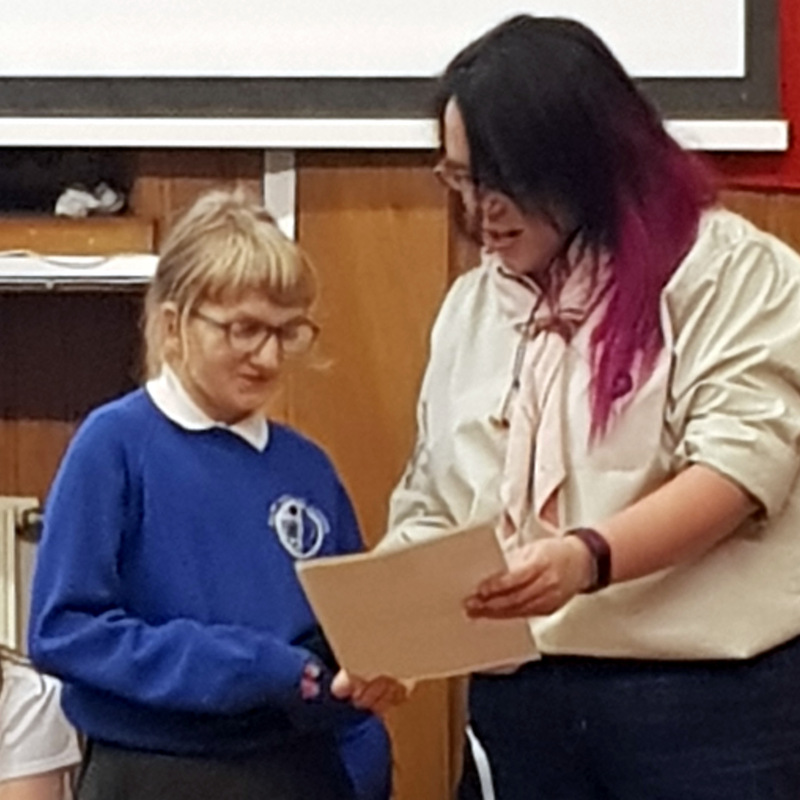 She received the Cornwell Badge, a certificate and also a letter of congratulations from Chief Scout Bear Grylls. 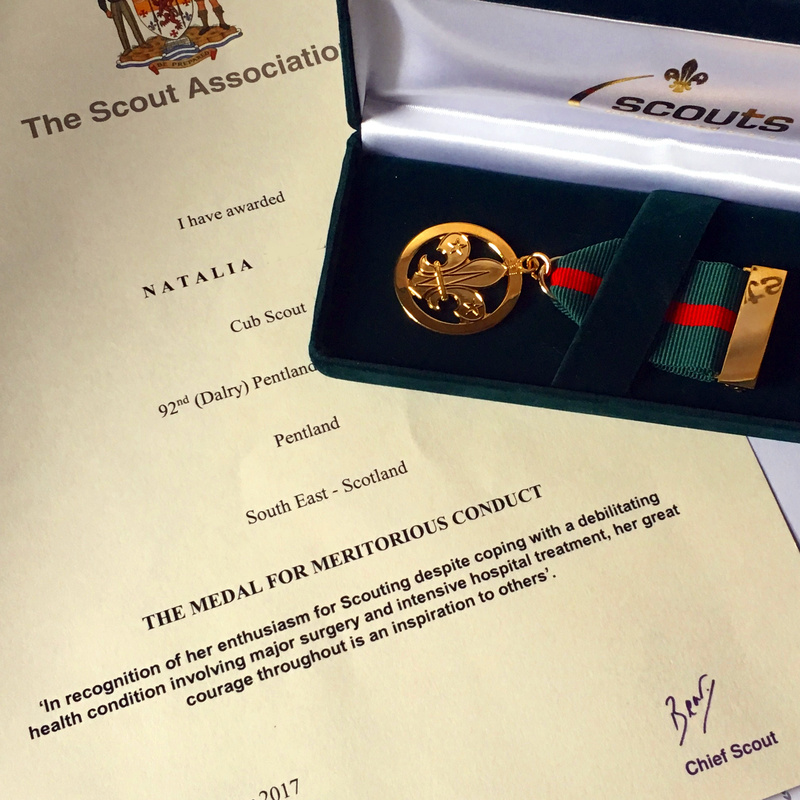 Natalia joined 92nd Pentland Beavers based at Dalry Primary school in August 2015 and moved up to Cubs in January 2017. She then spent several months in hospital, but as soon as she was well enough she was itching to get back to our group. She re-joined us in August 2017 like she’d never been away she is a very enthusiastic member of our group. She was presented with her award as a surprise at Dalry Primary school during assembly on Monday 27 November. Natalia is the first Young Person in our group to be awarded this prestigious honour. The Cornwell Scout Badge is awarded in respect of pre-eminently high character and devotion to duty, together with great courage and endurance. It is restricted to Beaver Scouts, Cub Scouts, Scouts, Explorer Scouts and Scout Network Members. Both the bronze badge and the cloth emblem of the same design may be worn. John ‘Jack’ Travers Cornwell, a Scout in the St. Mary’s Mission Group, Manor Park, London, entered the Royal Navy in 1915. It was wartime and training was brief, but Jack, helped by his days in Scouting, was able to adapt quickly. On 31 May 1916 while serving in HMS Chester, Jack was struck by a shell splinter. Grievously wounded, he stayed at his post awaiting orders until he was relieved at the end of the battle. On reaching port, Jack was transferred to a hospital in Grimsby and three days later he died a national hero. For gallantry he was given both the Victoria Cross and the highest Scouting award, the Bronze Cross. To commemorate the courage shown by Jack, The Scout Association created ‘The Cornwell Scout Badge’ in his memory. 2017 was an exciting time for Explorers in Pentland District with the establishment of two new Units within the District. Along with the Bore Stane Unit set up in August to provide Explorer Scout provision in the Bruntsfield area of Edinburgh, the DEPEVAK Unit was set up in Juniper Green in October to try to combat the number of Scouts from their partner group, the 31st Pentland Scout Group, who were leaving the movement when they reached Explorer age. The DEPEVAK name was chosen by the current Explorers and perhaps demonstrates some of the ambitions of the new unit as it is made up of the highest summits on the seven continents! The Unit held its first investiture in November, overlooking the District and wider Region on the side of Allermuir Hill in the Pentlands. 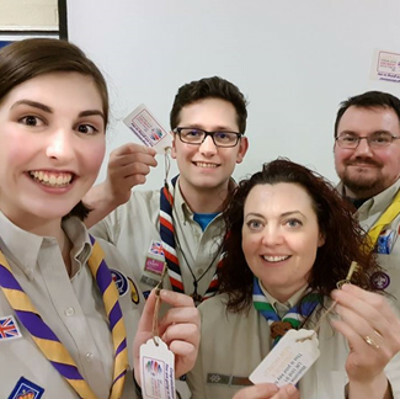 Both Units have full and varied programmes planned for the upcoming term, as they aim to give their Explorers the opportunity to continue their Scouting adventure.